Jeevan Ankur Plan of LIC is it for you? Home » Insurance » Jeevan Ankur Plan of LIC is it for you? Cost of living is sky-rocketing and with each passing year we are witnessing increase in the cost due to inflation and other factors. Do you really care for your child? Well it is very important to secure the life of your child for education for marriage and all other expense. Children’s life insurance policies provide cover for the child’s parent/guardian/grandparent for a specified term. This article describes about you should buy Jeevan Ankur policy or not ? If you are worried about child education or future expense of your child with age up to 17 year, LIC’s Jeevan Ankur is the newly launched insurance plan. Risk cover of plan will be on your life as a parent and the child shall be the nominee. The policy term shall be based on the age at maturity of the child. At the end of the policy term an assured maturity benefit equal to Basic Sum assured along with Loyalty Addition, if any, shall be payable irrespective of survival of the Life Assured. This can cause regular yearly income till policy term on death of life assured during policy term. On death of the child, the Life Assured will have an option to nominate another child/person and the policy will continue with the same benefit payable to new nominee/legal heirs after the death of the Life Assured during the term of the policy. This can cause conversion of this policy in to simple life insurance in case of parent has single child. The policy shall continue and the benefits shall be payable to the legal heir(s). This is actually good aspect of this policy as benefit will be given till policy term. You may choose accident benefit rider and critical illness rider for this one has to pay additional premium value. Downside of this plan is it does not provide loan facility. Jeevan Ankur as a plan gives very less return even it is as good as placing your money ideal. Consider following example given on LIC of India website. In above example premium is shown ad basic value without service tax. If you consider service tax premium for above example will be around 3640 Rs/- per year for 1 Lac risk cover. So, total premium paid by you will be approximately 91000 Rs/-. Final maturity given on above table is divided in two parts. Guaranteed return and Variable return. Variable return in above illustration are calculated so that they are consistent with the Projected Investment Rate of Return assumption of 6% p.a. (Scenario 1) and 10% p.a. (Scenario 2) respectively (as per LIC website). Variable return 10% will be bit difficult but still if we make assumption and calculate than effective rate of return is very low. 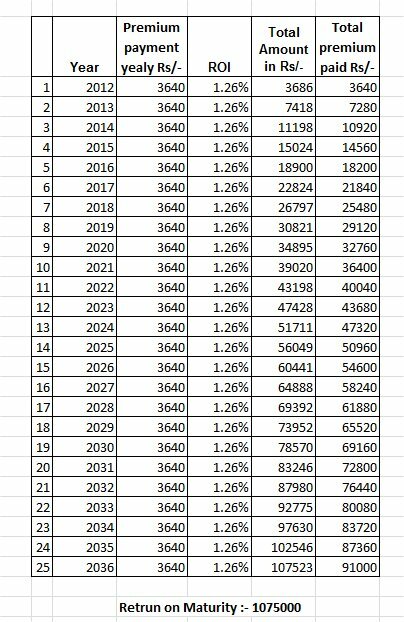 If we make simple calculation with cumulative return than for scenario 1 ROI will be 1.26% & for scenario 2 ROI will be just 5.44 %. Following table gives clear idea about same. 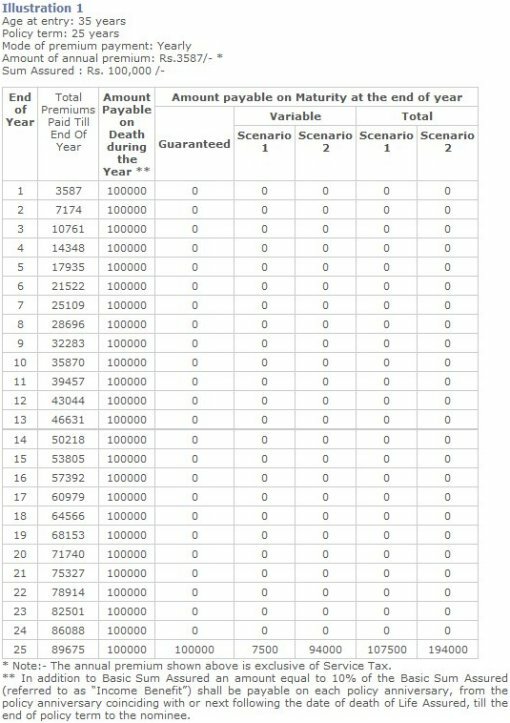 Return on Maturity calculated by above example on 1.26% is same which is shown as Total Return from LIC after 25 year considering scenario 1 . Considering today’s situation if you are planning to take this plan for your child education or marriage it is not advisable to do so. This plan even does not take care of inflation, today if for some career option fees are 2 lac than after 25 years this amount will be more than 20 lacs due to inflation. Instead of choosing this plan it is better to invest in small saving scheme like PPF where you will get 8.6% return and tax benefit too. Your agent must be marketing about this plan this is only due to high commission will be paid once you purchase this policy. Some agent may be ready to give you first commission or payment of first premium. Still do you need to buy Jeevan Ankur Plan? As per our analysis you should not opt for this policy. If you agree with our views must share this article with your friends /relatives probably you may save him by opting for wrong insurance plan. If you have any question regarding LIC Jeevan Ankur or any other LIC policy, feel free to post your comments below. « How KBC winner Sushil has spent his 3.5 crores ? Unfortunately Maturity amount of Jeevan Ankur is very low. Guaranteed return in your case will be 3 lac and variable return will be approx 2.5 lac. Wonderful explanation of facts avilaable here. Nice post with example what do you say guys & girls ?